These are the words of Prof. Wayne Baker, describing what social capital is. In his book “Achieving success through social capital” he open a whole new world of understanding how networks and the relationship with everyone around you can be significantly important for your personal and professional well being. It’s a privilege and honor to have him as our online-speaker of Social Capital Boosters, Ep. 4. Prof. Baker will be introducing to our audience the concept of social capital and its importance to society development and strong democracy. He will be speaking about the power of building relations and networks, based on the philosophy of reciprocity and giving to others. We need to understand the crucial role of networks in a society where everyone is connected. Literally everyone. Dr. Wayne Baker is Robert P. Thome (“Toe-May”) Professor of Business Administration and Professor of Management & Organizations at the University of Michigan Ross School of Business. He is also Professor of Sociology at the University of Michigan and Faculty Associate at the Institute for Social Research. He was the first director of the Center for Positive Organizations (CPO) and is currently Faculty Director of the CPO Business Consortium. A former chair of his department, he currently serves as an elected member of the Ross School’s Executive Committee. His teaching and research focus on social capital, social networks, generosity, positive organizational scholarship, and values. He has published numerous scholarly articles and four books. His management and leadership articles appear in venues such as Harvard Business Review, Chief Executive Magazine, and Sloan Management Review. He puts his knowledge into practice as a frequent guest speaker, management consultant, and as an advisor to Give & Take Inc. for the GIvitas collaborative technology platform. He has won various awards, including most recently the Senior Faculty Research Award from the Ross School of Business and the Best Article Published in 2014 – 2016 from the American Sociological Association Section on Altruism, Morality, and Social Solidarity. Prior to joining the Michigan faculty, he was on the faculty at the University of Chicago business school. He earned his Ph.D. in sociology from Northwestern University and was a post-doctoral research fellow at Harvard University. He resides with his wife, son, and a Birman cat in Ann Arbor. 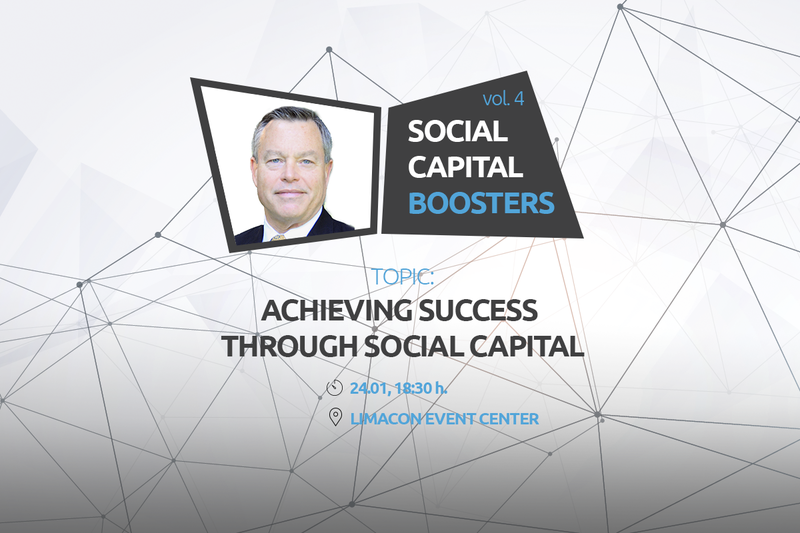 So, be invited and come on 24.01., starting at 18:30 at Limacon Event Center to hear and discuss the power of social capital.